An end to ardour. When the dying death of last light was beautiful and all things fade like the sun. The roses are in their swollen bloom, the color of dusk. There’s a heat to it. A heat that comes with the end of things. I pluck a rose and feel it. Feel the bloom, know the bloom, I am the bloom. And then it withers and I feel that too. The rose and I know much of withering. For I withered once, once in December. I've always thought there are certain blossoming’s that wild things must know, just as there are certain burnings the body must endure. How flowers understand their fated end. The end that comes from being plucked, loved, and cherished. I wonder how true that is for us too. But blossoming, blossoming is the sole thing for which we were built. This Rhubarb, Rose and Almond Cake with White Chocolate Swiss Meringue Buttercream has been on the back-burner for months. For lack of a better reason, I got consumed. Again. But, I wanted to bring it to the blog before rhubarb season was well and truly over. Rhubarb has always been one of my favorite ingredients to work with. Its distinct tartness when paired with sweetness from white chocolate and floral notes from rose is a combination that’s forever entrenched within my heart. And when paired with the earthen undertone of almond, it’s heaven. 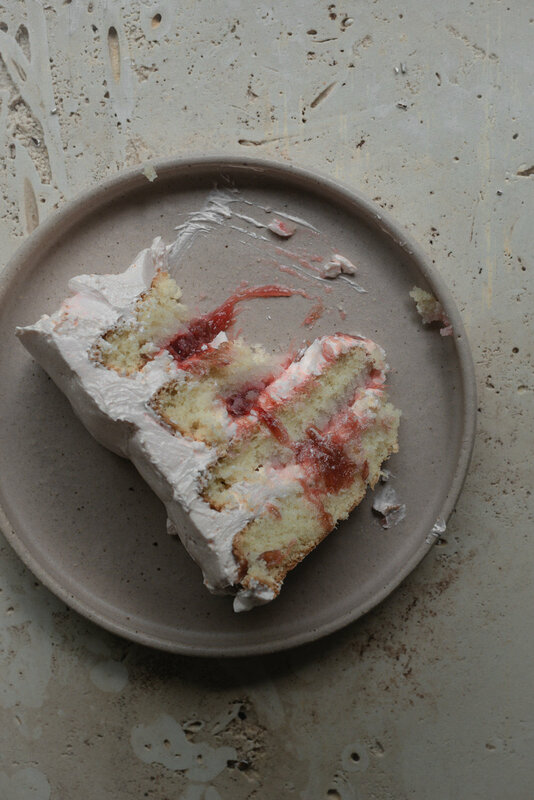 A slice of cake that’s not easily forgotten. The cake is made using the reverse creaming method, which uses the technique of incorporating the butter into the dry ingredients instead of creaming together the butter and sugar. The result is a cake that is kept moist for longer, with a finer crumb and bakes up almost always flat. If you don’t care for gin, you could replace it with another alcohol of choice. Amaretto would be a perfect substitute. Or, if you prefer not to use alcohol at all, simply replace the gin with an equal amount of water. The recipe for the white chocolate swiss meringue buttercream makes a lot, enough to thickly frost the cake however way you desire. I decorated the cake in generous swoops and swirls of buttercream but you could frost it thinner for a more naked cake effect. The recipe will also yield more than enough for piped detailing if you so desire. I’ve left it up to your discretion. I used a little pink food coloring to dye the buttercream. A few drops was all it took for a beautiful pastel pink shade but you can add as many drops as you feel necessary to achieve your desired aesthetic. Pre-heat the oven to 180 c (350 f). Grease and line 4 x 18 cm cake pans with non-stick parchment paper. Set aside. In the bowl of a stand mixer fitted with the beater attachment, beat the cake flour, almond meal, baking powder, baking soda, salt, and sugar, until the dry ingredients are evenly distributed. Set the mixer speed to medium. Add in the butter, a tablespoon at a time, until it is all used up. Continue to beat for a further 3 to 5 minutes, or until the mixture forms a well combined sandy meal-like texture. Meanwhile, in a separate large pouring jug or mixing bowl, whisk together the egg whites, whole milk, rose water, vanilla bean extract, and almond extract. Set the mixer speed to medium-low. Pour in half the liquid ingredients. Beat until just combined then pour in the remaining half. Pause mixing to scrape down the bottom and sides of the bowl as needed. Increase the mixer speed to medium-high and beat the batter is light and fluffy, 3 more minutes. Divide the batter between the prepared cake pans and use a rubber spatula to help smooth out the tops. Bake, for 25 to 35 minutes, or until the cakes are risen, lightly brown, and a skewer inserted into the middle comes out clean. Remove from the oven and let the cakes cool in their pans for 15 minutes before carefully turning out and onto a wire rack to cool completely before frosting. Once cool, level off any domed tops. To make the rhubarb compote, place the rhubarb, sugar, lemon juice, rose water, and vanilla bean seeds into a medium-sized saucepan set over medium-low heat. Heat, stirring occasionally, until the fruit has softened, is beginning to break down and the sugar has dissolved, about 8 minutes. Increase the heat to medium. Continue to cook, stirring often, until the mixture reaches a light rolling boil. Reduce the heat back to medium-low. Allow the mixture to slowly simmer for a further 6 to 8 minutes, or until reduced by a quarter. Remove from the heat and place it into a medium-sized bowl. Allow the mixture to come to room temperature, then, place it in the refrigerator to chill until further needed. It should have thickened up and must be completely cool before use. Combine the sugar, water, and gin in a medium sized saucepan set over medium heat. Heat, stirring often, until the sugar is dissolved. Bring the mixture to a light rolling boil, then, remove it from the heat. Immediately use a pastry brush to evenly glaze the cut tops of the cakes with the sugar syrup. Put the white chocolate into a medium-sized heatproof bowl set over a saucepan of barely simmering water on low heat. Do not let the bottom of the bowl touch the water. Heat, stirring often with a rubber spatula, until the chocolate is melted and smooth. Remove the bowl from the heat and set it aside to cool. Next, place the egg whites and sugar into the bowl of a stand mixer. Whisk by hand to combine. Place the bowl over a saucepan of barely simmering water set on medium-low heat. Do not let the bottom of the bowl touch the water. Heat, whisking often, until the mixture reaches a temperature of 70 c (160 f) on a candy thermometer. The sugar should be completely dissolved and the mixture hot to the touch. Once at temperature, remove the bowl from the heat and set it on the base of a stand mixer fitted with the whisk attachment. Add in the butter, a tablespoon at a time, until it is all incorporated. Add in the melted and cooled white chocolate, rose water, salt, and a few drops of pink food color. Increase the mixer speed to high and continue to beat until the buttercream is thick, evenly dyed, and silky smooth, 5 more minutes. Set aside for assembly. Place the first cake layer cut side facing up onto a serving plate or cake stand. Using an offset spatula, spread about 4 generous tablespoons of the buttercream over the top and sides of the cake. Slightly hollow out the center of the buttercream with a metal spoon to form a “dam” which will create a little edge that makes sure your rhubarb compote doesn’t overflow the sides of the cake when filling and layering. Gently add on the second cake layer, cut side facing down. Again, repeat this frosting and filling process. Repeat again for the third cake layer. Gently press on the final cake layer, cut side facing down. Cover the top and sides of the cake with a thin layer of the buttercream then set the cake in the refrigerator to chill the crumb coat until firm, about 30 minutes. Remove the cake from the refrigerator and use a large offset spatula to thickly spread on a final layer of the buttercream, or however you wish. Place the cake back in the refrigerator to set for a further 30 minutes, before slicing and serving.